The Model 106/206 PGM-2PR-630-SM pressure management valve with integral backup is designed for applications where failure is not an option. 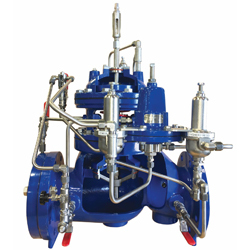 This valve hydraulically manages pressure around the clock to reduce water loss, save money and prevent unwanted pressure spikes that contribute to premature pipe failure. Built on the 106-PGM or 206-PGM main valve, a simple field retrofit is possible using the paddle-style orifice plate.